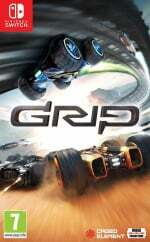 Supersonic racer GRIP: Combat Racing has just received a huge dollop of content as part of the development team's aim to provide continuous support for the title going forward. You can check out some of the new content in the trailer above; the update adds four free new tracks and the introduction of Team Racing and Deathmatch. We've got all the details you need in this super lengthy list below. - Team Racing - Players can now join either Red or Blue teams to battle it out in any racing mode. These include: Classic Race, Ultimate, Elimination and Speed Demon. The team with the highest points wins! - Spin Cycle (Liddo5) (Forest) Key sections include an open area with nice autumn visuals, tunnel turns perfect for barrel rolls, glass tunnels and an obstacle ridden turn to the finish! ($1.99 / £1.69 / €1.99 individual packs. Also available as a money saving bundle) Available on Steam April 5th and later this month on console) Glow hot with new skins, decals and rims for each manufacture! If you already own the game, make sure to jump back in to try out all of these new features; if you don't already own it, perhaps this would be a good time to give it a go? Feel free to read our review if you'd like to learn more, and let us know if you'll be checking it out with a comment below. Oh yeah, time to jump back in!!!! Interesting. I was just thinking about this game (30% off right now) and wondering if it would satisfy my desire for an arcade racer on the switch. It is a great arcade racer already. Never did get around to buying this... is it as good as the old Roll Cage games it was based on can anyone confirm? So is this game any good guys? I heard mixed things on switch when it launched. @NinjaWaddleDee I enjoy the game, but I've made it to the fourth of ten levels in the single player campaign, and the frustration level is pretty high. And it's not just a case of needing to "git gud." The controls are touchy, and if you crash, you often go flailing all over the place or you car jets jammed in a corner so that you fall way behind. It often feels unfair. And as far as this new content, I'm happy to get new tracks, but the other stuff is all for multiplayer on-line... Only ONCE have I ever encountered another person on-line, so that seems kind of pointless. I enjoyed it; I know people complained about 'twitchy' controls, but I think it's just the way the cars are supposed to control. You have to adapt your driving style to the sensitivity of the controls. I have just this lunchtime purchased this from Game in the Easter sale (£19.99). Looking forward to trying this out tonight and hopefully over the weekend if it's good. The only thing i hate is that no one is playing ONLINE on Switch. I dont know if im doing something wrong. Have they eliminated the uber annoying situation where your vehicle bounces/swerves into being stuck on the course by some object and having to reverse and then not really being sure which way is forward?!? That crushed any affinity I had for this game at launch . . . .
@manta005 In my Wii U and Switch experience, the only games that had robust lobbies were Mario Kart, Splatoon, Fortnite and Rocket League. Adding a paywall (to which even a loyalist like me is not subscribed) had to kill online play even more for niche games like this. It’s a good game, I like it. But it could be great. It reminds me more of the Motorstorm games than Rollcage, you never feel you have full control of your vehicle as you hurtle down the track. Sometimes it’s hard to see oncoming obstacles(like directional barriers) which will put you to a dead stop. When the game was released I read the developers were going to fix the twitchy controls, I wonder has this happened? I found this game almost unplayable at speed. The framerate really doesn't help but its the course design more than anything that is frustratingly difficult to navigate. Unless they've sorted those things out then I'm not gonna jump back in. The one gripe is the issue when you can go from first to last with a single bump off the course. You need patience and the online seems to have no players.... However, I can easily see me getting a good 15+ hours with this as there is 23 courses and the death match arena mode plays well. Its a good break from the racing action and there seems to be 6 arenas which makes it a decent game mode in itself. When the additional 4 tracks are added that will help further. To those on the fence, the game is well worth getting if you liked extreme G/Rollcage back in the day. And worst of all, it's glitchy as hell. Worst issue being that if you don't have NSO, the game will try to connect to it 4(!) times after every single race - each time requiring a manual cancel from the player. No one gonna mention how they should have made it more like Firebugs than RollCage? Whilst the latter had "stage 2", the former never had that luck but was more vibrant and fun. The tracks were all far more interesting and it felt like a mix between a serious racing game and a kart racer. If you still have a ps1 or emulator for that then I'd suggest trying it if you want a RollCage or Grip type game and like Mario Kart also.